Tàpies: From Within is a major historical survey that features a selection of more than 50 large-scale paintings and sculptures, representing diverse moments from throughout Antoni Tàpies’ career. These include early examples from 1945 through to recent works created in 2011—the year prior to his death. The exhibition explores the Spanish artist’s use of unusual materials and forms and the development of his unique visual language, which earned him an international reputation as one of the most successful abstract painters of his generation. 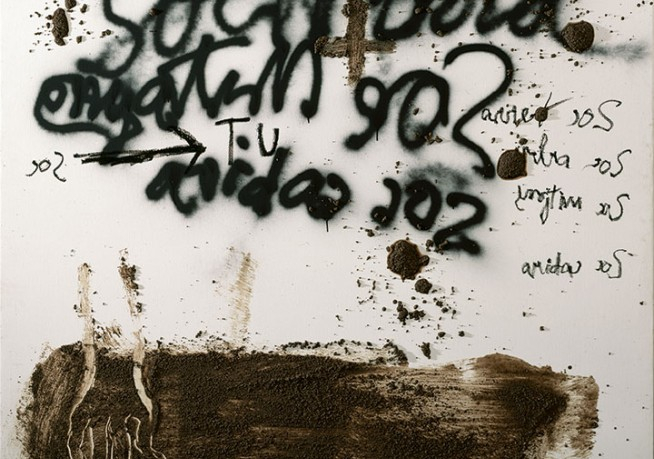 Curated by former Tate Director Vincente Todolí, this retrospective offers a unique view into Tàpies’ groundbreaking practice, which fused impoverished materials with symbols of Eastern and Western culture to create dense works covered with graffiti-like gestures. His alchemical practice mixed spiritual and existential questions with unique material investigations of surface, mark-making, and found objects. The exhibition presents an intimate and unusual view of his oeuvre, through a selection of works drawn exclusively from his own private collection and that of the Fundació Antoni Tàpies. Tàpies. From Within is an exhibition organised by Fundació Antoni Tàpies, Barcelona, in collaboration with the Museu Nacional d’Art de Catalunya, and curated by Vicente Todolí.